Gender Opportunity Opportunità di Genere: And the Agenda of Women? And the Agenda of Women? The American political debate rediscover women. It seems to go back in time, so far away, when one realize that women could be important, but not for their role as housekeepers, because it was, and is, a matter of fact, it doesn’t matter admit its significance, neither as active companion in the arrangement of society, nowadays we still are a “protected” minority, but we are however a score to conquer, as it always was in an atavistic behaviour. So in the XI century what Giambattista Vico called “occurrences and recurrences of history” is happening again, history again presents itself. Reading American newspapers one can think that women have become an important issue, and it is but just as a mere hoard of votes, so why not to buy them up in any, also clumsy, way? Democrats cut the freedom of women, granted by free birth control, on the protests of some religious, Republicans, on the other hand, are alarmed by this strategy for conquer women’s attention and have to find a way themselves and finally they did: the solution has come, an old, as ancient as Bible, one could say, and in effect, you won’t believe it!, it’s about Bible; “what?? ?-You may say", yes: Bible. It’s in there, in fact, that Republicans have found the offensive action to reconquer women’s votes. Yes, you've right read and understood: the Bible. In the recent republican congress, Steve Pearce, has argumented his strategy to give his party a refreshment with women’s vote. In his latest book “Just Fly the Plane,stupid!”, Pearce dishes out his recipe: “ The wife is to voluntarily submit to her husband” as it’s written in the Bible, even if he also admit that: “ the principle is among the most controversial of all directives coming from the Bible” and continue to argue that,- so don’t worry ladies-, the submission doesn’t mean inferiority, -don’t misunderstood sisters-, because it’s “rather that husbands and wives play different roles” in fact “ the husband’s part is to show up during the times of stress, take the leadership role and be accountable for the outcome, blaming no one else”, hear ye. It’s just a matter of “ obedience to the Lord and of love her husband” and her (re-new) lord, one could add. It seems to hear the voice of Pope Pio X who in 1930 wrote the Enciclica Casti Connubii where he argued that: "This order requires on one hand the superiority of the husband over his wife and children, and on the other hand, the ready subjection and obedience of his wife, not by force, but as is recommended by the Apostle in these words: "The women are subject to their husbands, as unto the Lord, because the man is head of the wife as Christ is the head of the Church ". 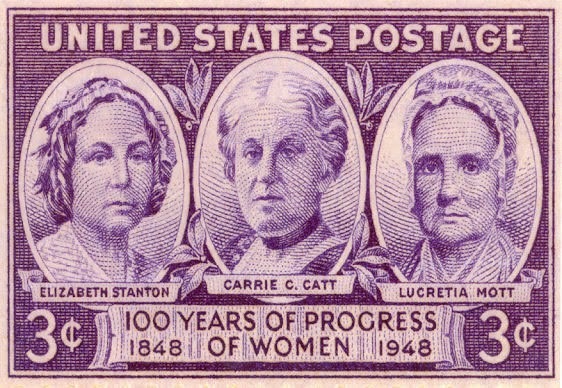 But here we’re in Elizabeth Cady Stanton and Lucretia Mott nation which, for sure, couldn’t ever think that their revendication for a right, because it’s about this, a right, would become a propaganda sheer tool at women's expense. We’re in here to notice once again, once more, that one is taking advantage of women and only for scores that don’t refer to women’s growth in society, business, health,.. it’s just the old, known story. It’s to be said that “the world is a village”, from Italicum* to Unicum…unfortunately!. *It’s the name of the latest Italian election proposal.